Earth's Albedo Tells an Interesting Story | Watts Up With That? The Earth’s climate depends on the net sunlight deposited on the globe, which is critically sensitive to the Earth’s albedo. 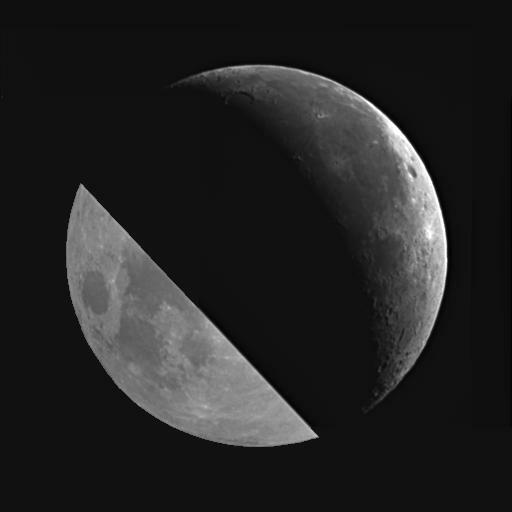 A global and absolutely calibrated albedo can be determined by measuring the amount of sunlight reflected from the Earth and, in turn, back to the Earth from the dark portion of the face of the Moon (the `earthshine’ or `ashen light’). What earthshine looks like on the moon, using photo enhancement on the lower left. BBSO uses a blocking filter to dim the moonshine crescent, typically about 10,000 times brighter than the earthshine. In simple terms, the lower the albedo of the Earth, the greater amount of solar radiation it will absorb. The greater the albedo, the more solar radiation is reflected. This of course affects earthly temperatures. The Earthsine project is producing some very interesting results. Notably, that the Earth’s Albedo has risen in the past few years, and by doing reconstructions of the past albedo, it appears that there was a significant reduction in Earth’s albedo leading up to a lull in 1997. 1998 has been touted as one of the warmest years on record, and the time lag may have had to do with the thermal inertia of the oceans. Then the albedo increased, making the earth more reflective. Clouds have the greatest potential for changing albedo on a short time scale. Reconstructed annual reflectance anomalies, Δp* (black) with respect to the mean anomaly for the regression calibration period, 1999-2001 (gray band). The large error bars result from the seasonal variability of the Earth’s albedo, which can be 15-20%. Also plotted (blue) are the ES-observed annual anomalies for 1999-2003 and 1994-1995. The right-hand vertical scale shows the deficit in global SW forcing relative to 1999-2001. The red solid bar represents the accumulated forcing (in W / m2) attributed to the greenhouse gases concentration increase over the last 100 years, from the International Panel for Climate Change (2001). Image credit: Earthshine Project, BBSO. Carbon dioxide: 1.5 Watts per square meter. Methane: 0.5 Watts per square meter. Nitrous oxide: 0.2 Watts per square meter. Halocarbons: 0.2 Watts per square meter. Total from all greenhouse gases: 2.4 Watts per square meter. This rapidly changing albedo lends some credence to Svensmark’s theory of Earth’s cloud cover being modulated by Galactic Cosmic Rays, but it could also be caused by other factors such as aerosols. = Earth’s average albedo is not constant from one year to the next; it also changes over decadal timescales. The computer models currently used to study the climate system do not show such large decadal-scale variability of the albedo. 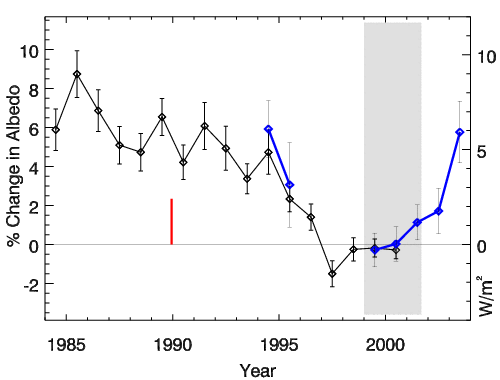 = The annual average albedo declined very gradually from 1985 to 1995, and then declined sharply in 1995 and 1996. These observed declines are broadly consistent with previously known satellite measures of cloud amount. = The low albedo during 1997-2001 increased solar heating of the globe at a rate more than twice that expected from a doubling of atmospheric carbon dioxide. This “dimming” of Earth, as it would be seen from space, is perhaps connected with the recent accelerated increase in mean global surface temperatures. = 2001-2003 saw a reversal of the albedo to pre-1995 values; this “brightening” of the Earth is most likely attributable to the effect of increased cloud cover and thickness. These large variations, which are comparable to those in the earth’s infrared (heat) radiation observed in the tropics by satellites, comprise a large influence on Earth’s radiation budget. Considering that each act of combustion creates new H2O – as much or more than CO2, one wonders why water is not considered also at least a partly manmade greenhouse gas. Let’s see how this data is handled on the other blogs. First they’ll try to tie it to big business (oil, gas etc). The lead researcher used funds provided by the National Institute for Global Environmental Change (started by the U.S. Senate), and got NO help from NASA. Next they’ll look at the past reports, papers, and associates of the lead researcher. Actually, it was Bob Corfmack (17:57:56 on the “all quiet alert” thread) that posted the first mention of the project, I only posted the chart shown. Rather interesting that albedo has climbed during the well publcized shrinking of arctic ice. After digging through layers of “stuff” on the BBSO website, I came up with the abstract for the study, including information that someone in the 1920’s was doing the same research. Thanks for the info. I still wonder if the Earthshine project is still active. NASA also seems to have satellite derived albedo measurements. The links seem to be contradictory with each other and with the BBSO data. Has anyone seen anything to suggest that this project is still alive ?? -I seem to remember that the graphs came in for a bit of stick when they were first published. (maybe from RealClimate ). Wow! Those are big changes over short periods. Makes me wonder how much temperatures measured a few feet above the ground really tell us about the Earth’s energy gain/loss. So, we have a quiet Sun. We have increasing albedo. We have a possible PDO flip. We have high geopolitical danger and nuclear proliferation. I am stocking up fire wood and food, among other countermeasures. Henry, I had a poster on another forum actually use “lunch with Dr. Timothy Ball, a known denialist” as a reason to discount a particular scientists views. Looks like the Albedo observations were last done in 2002. I only have enough firewood split for this winter. Thankfully, I have enough trees for another 15, easily. I also have a herd of 8 deer that annoy us daily. That should give the family enough meat for a while. Neophite question: so the albedo is the inverse of the libido, right? Because the libido gets bigger the darker it is. Sorry, I couldn’t follow the graph…. RE: 20071017 18:57:26 – Do note, the graph stops at 2004. I wonder what it’s at now? Too bad we don’t have a long record to compare with. That would be even more interesting. It appears that the project is being retooled for a worldwide setup and automation. BBSO observations are currently being supplemented with others from the Crimea in the Ukraine, and there will soon be observations from Yunnan in China, as well. A further improvement will be to fully automate the current manual observations. A prototype robotic telescope is being constructed and the team is seeking funds to construct, calibrate, and deploy a network of eight around the globe. While the web page looks stagnant, perhaps they are just working on the rollout of the new network. I have an email in to the principal researcher inquiring as to the status. I’m still puzzled by NASA’s claim that their CERES data shows decreasing albedo since 2000. This contradicts the Earthshine data for roughly the same time period. Perhaps their definition of albedo is different? Any thoughts? Here’s the corresponding article from RC, including an update to the chart THAT IS NOT SHOWN ON THE BSSO WEBSITE. Their chart shows a decrease in 2004. Don’t yet see the data to show that. They also link to the paper by Pelkie (sp?) et al, including the original researchers. It seems interesting that the changes reflect a relation to the “manmade greenhouse gases” but not a absolute link. I think this would be another nail in the “Global warming is only a manmade effect” coffin if the Global warming fanatics weren’t on a campaign to disregard all solar activity as a possible cause for (some/all)current warming. I think RC is pulling a fast one. This is NOT the same chart as shown on the BSSO website, or shown in the paper by Palle et al that they link to. Where did THEY get data not available at the BSSO site? Pallé et al. used a multiple regression of 1999–2001 ISCCP data with overlapping ES observations to construct from the former a proxy for the Earth’s reflectance. Here that proxy has been PROJECTED FORWARD beyond 2001 through 2004 using the new ISCCP data. The result, plotted in Figure 2, shows an increasing trend after 2000, in agreement with the ES data. The article still says that the albedo was increasing, based on cloud data (ISCCP data), but still forced the line on the chart down. Go figure. Please help me understand one thing. The y-axis is “% change in Albedo”, rather than actual albedo. So, for 2 or 3 years there was a slight negative change in albedo, and for a lot of years there was a slowing in the *increase* in albedo. In other words, according to this chart, the albedo of the Earth was actually increasing through 1996, decreased slightly for 2 years, stayed basically stable for 2-3 years, and then has started increasing again. Thus The 2-year period of negative % increase reflects an actual slight (not significant) albedo drop? Basically I don’t want this research to get caught in the trap other “researchers” so easily get caught in — conflating a drop in rate of increase with an actual drop in albedo. They’ll see it in the incoming moderation que. So even if the discussion is old, it will be seen right away. Chris – I don’t know the answer as to why satellite measurements show a different result. The only advice I can offer is that we’ve got two completely different measuring systems, using different optical paths, run under different methodology. The earth based telescope albedo method has been in use for almost 100 years, and hasn’t been shown problematic. Satellite albedo measurements are much newer, and we don’t know if they are problematic or not. I would point out that with a satellite measurement, the environment and instrumentation platform sometimes has unknowns or things not thought of. A perfect case in point was John Christy’s satellite measurements of atmospheric temperature which initially showed a cooling trend, until someone pointed out that he hadn’t factored in an orbital decay issue [ I think that’s what it was] on the measuring platform, and the cooling trend turned into a slight warming trend. NASA has been known to make huge blunders over simple things, like launching the flawed Hubble mirror into space without first testing it, or losing a mars probe because one group worked in metric and the other in English units, resulting in a navigation error which crashed the probe into the surface. Then there’s the shuttle incidents, both products of an inflexible hierarchy that refused to see problems. Then we have the .15 degree temperature error in NASA GISS surface temperature data found on August 8th. For all we know, the satellite albedo sensor system may have a sign error or there could be some other factor, or it may be absolutely right. My hunch is that they are using sensors on the spacecraft not specifically designed to sense albedo, but are putting other sensors into service for the purpose. Correct me if I’m wrong. The point is, space based measurement is not easy and has many complexities over ground based measurement. My money is on the earth based telescope method because it is a simpler and established technique, and more importantly, there’s less to go wrong when you have a small group of dedicated scientists working on a single ground based measurement than when you have a whole far flung government bureaucracy working on a space platform. Simplicity is not a strong attractor of entropy. I’m sure that with all the mention they’re getting here, it won’t be long before they revisit their article. In the meantime, post THEIR version of the chart (with proper credit, of course) below the one taken from the BSSO website. From “RTFR” that rabett recommends, we find that it was Pallé et al. that modified the chart. Which makes it even more strange, because the “et al” includes the folks at BSSO. Note to Anthony: When the researcher replies, ask if he knows if the old (1920 – 1960) data by Danjon and Dubois is available. Pallé et al didn’t say anything about the old data. Thanks for the insight. When Googling, I came across a presentation which attempts to explain the difference. It seems a bit one-sided in criticizing the Earthshine methodology without considering the flaws of satellite measurements. I guess that’s our tax dollars at work. 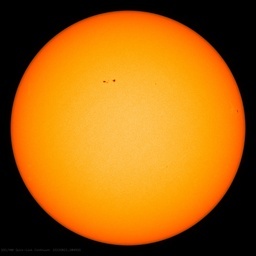 By the way, NASA has also made outlandish predictions for solar cycle 24. Some of the problems between surface readings and satellite readings were mentioned in some of the stuff I’ve browsed. 1. Surface readings limited by view (cloud cover, moon phase, etc) and satellites not effected. 2. Satellites get a “spot” or swath of an area, while the surface readings get more of a “global” reading. 3. It could be a carry-over “error” like the one that affected the satellite temp readings: they forgot to take into account orbital decay (apogee/perogee). Earth-to-moon distance stays relatively stable, doesn’t it? This albedo question is all the more reason to get the Triana satellite out of storage and launched to it’s L1 point. It’s one of the few things, perhaps the only thing, that Gore came up with that I agree with. You mean besides the internet? I see a design life listed of only TWO YEARS! Jeez, comm satellites have longer lives than that and do a lot more. A two year albedo plot does not a trend make, no matter how accurate. I’m really surprised at such a short life span. It seems almost pointless to launch it then. Chris I read the short paper from CERES, and it seems that they have a point. It appears that seasonal and angular variations aren’t well considered in the BBSO data. I’ll check a couple of other sources to see how the CERES critique holds up. I would add that inevitably, the Earth based telescope – earthshine measurement integrates everything reaching that part of the moon from that side of the earth, and would also tend to filter out higher frequency noise. Sounds pretty good to me! It’s too bad we can’t come with a way to use the most stable satellite base we have: the moon. If we could launch a probe, set it to face the earth, and take continuous pictures, unhampered by cloud, atmosphere, and pollution problems. It would see the entire face, all 360 degrees, and radio that data back to earth. No, the Earth-Moon distance doesn’t stay relatively stable. The distance is increasing, and this has been measured by laser (Apollo missions left mirrors on the moon just for this purpose). See this article or search for “Tidal Recession Earth Moon”. Yes the laser reflector data does show Earth’s Moon increasing in overall distance, about 3 inches per century. Pingback: Celebrity Paycut - Encouraging celebrities all over the world to save us from global warming by taking a paycut. What is the current data on grey snow from soot deposition on the polar cap? Isn’t there a measurable reduction in albedo that would increase absorption and accelerate snowmelt? I see China’s official ‘Polar Climatologist’ Dr. Rebecca Lee (actually a PLA graphic artist) stating that Global Cooling is a direct consequence of Global Warming! They’re using their clever ‘Jedi mind tricks’ to deflect the blame on their infamous ‘Brown Cloud’ as a contributor to climate change. Perhaps their ‘alleged’ $300 mil investment in Al Gore’s $5 bill global green fund is albedo increasing whitewash reflecting back the shaming gaze of a watching world.